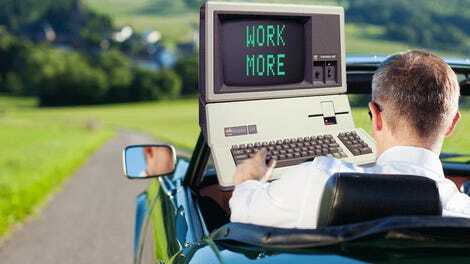 As if enduring a long work commute to start your workweek isn’t dreadful enough, General Motors CEO Mary Barra is apparently envisioning a future where your vehicle’s equipped with self-driving technology that facilitates the environment of a “second office.” Rather than enjoy a leisurely commute at the behest of your vehicle, motorists can replace the stress of a typical traffic jam with answering emails from the moment you shove off for work. Speaking with Business Insider, which curiously describes the vision of a mobile second office that would effectively end any pretense of a relaxing drive as “leisure time,” Barra said self-driving technology will lead to a drop in fatalities and ease congestion. Without driving, that opens up the ability for the motorist to focus on other things—like work. Though I think it’s safe to say this self-driving reality is probably a ways out, that doesn’t stop the auto industry and tech sectors from planning for the future. And the way Barra jumps to imagining the experience as being ready for a workaholic sounds unpleasant. “Whether it’s a second office or entertainment, I think there is a lot of new opportunities when you have that person in the vehicle,” she told Business Insider. GM has pitched a long-game on autonomy: This year, it purchased the autonomous tech firm Cruise Automation, aim to have Lyft (which it has invested $500 million in) drivers pick you up in self-driving cars, and it plans to start testing autonomous vehicles on Michigan roads early next year. While it’s obviously sensible to make use of the extra time that comes from not having to drive, most of us would probably prefer to hold off on being bludgeoned with work-related items until we’re at, you know, work.